Investment scale, production efficiency, final cost, operational reliability are important factors for sand making process. Now, there are many problems in some sand making production line, such as unreasonable process, improper equipment, mismatched sieving system, complex transport system, inconvenient maintenance, etc. Some large scale production lines should be invested so much money, and low equipment utilization will lead to high production costs. How to choose the model of sand making machine has been the key to the question. There are many sand making machines you can choose, such as rod mill sand making machine, hammer type sand making machine, impact crusher, rotary disk sand making machine and vertical shaft impact crusher, and each of them has disadvantages and advantages. When choosing the model of sand making machine, you should know about the specification and power. The production line should match with local environment, and the equipment should match with the requirements of input size, capacity and efficient. Incorrect model of equipment will cause many problems, such as low efficient, big energy consumption and so on. According to on-the-spot investigation, you can design a detailed solution and utilize terrain elevation difference. The production line often adopts two stage crushing or three stage crushing, and how to reduce operating power and cost is very important. 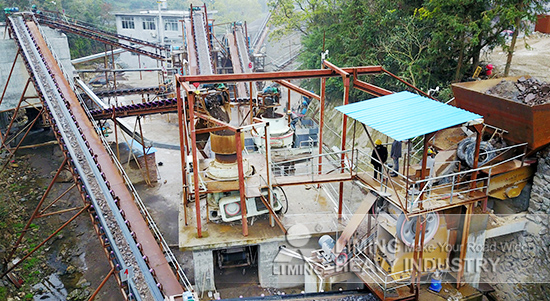 Crushing equipment, sand making machine and screening equipment should be suitable for the production line, and it must be convenient to maintain for these machines. In addition, it rains a lot in some areas, so you should ensure the equipment can put into operation regularly on rainy days. Wet process is a pretty good way to make sand, because it can prevent dust from polluting the product. This method makes product more quality and efficiency higher. And the utilization ratio of equipment is improved without the influence of weather.